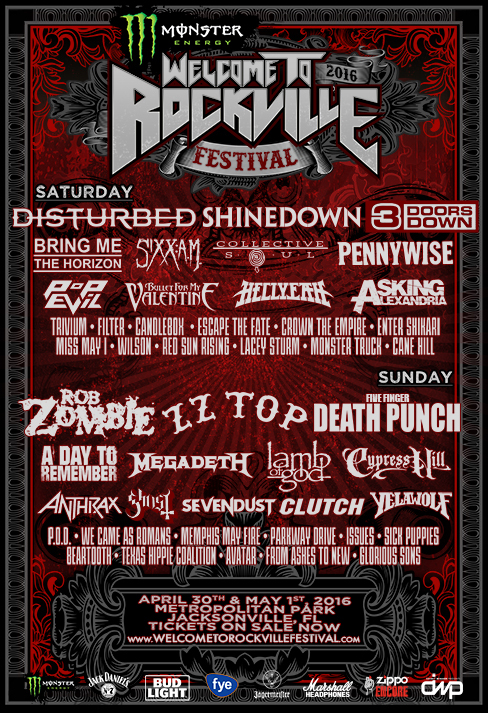 Additional onsite festival experiences have been announced for the sixth annual Monster Energy Welcome To Rockville, Saturday, April 30 and Sunday, May 1 at scenic Metropolitan Park along the St. Johns River in Jacksonville, Florida. The destination festival features a lineup of over 45 bands, including rock icon/filmmaker Rob Zombie, Disturbed (who have returned after a 4-year hiatus), Jacksonville’s own Shinedown, Five Finger Death Punch, ZZ Top, A Day To Remember, Bring Me The Horizon, SIXX:A.M., Megadeth, Lamb Of God, and many more. Visit www.WelcomeToRockvilleFestival.com for the full band lineup. 2016 also marks the return of Monster Energy Welcome To Rockville Tequila World Presented by El Jimador and the debut of Gourmet Man Food, Craft Beer selections, and the Jack Daniel’s Whiskey Row Experience. General Admission and VIP tickets are available for purchase now at www.WelcomeToRockvilleFestival.com. Ticket prices will increase at 11:59 PM ET on Sunday, April 3, so fans are encouraged to buy now and save. Weekend Zippo VIP Ticket 2-Packs are available for purchase through Friday, April 1. The current Monster Energy Welcome To Rockville onsite experiences are listed below. Bud Light: America, they say we’re a nation divided. They say we disagree on everything, but they’re wrong. We agree on a lot: liberty, justice, ROCK MUSIC, and beer. Nothing brings America together like Bud Light and nothing brings rock fans together like Monster Energy Welcome To Rockville. That’s why we’ve formed the Bud Light Party – a party for everyone. We are the fake political party America needs right now and we’re stopping by Monster Energy Welcome To Rockville to supply ice cold beer all weekend long. Because no matter where we stand on the issues, we all sit on the bar stools with our hands raised in the air listening to our favorite rock bands. America has seen the light, and there’s a Bud in front of it. f.y.e. : f.y.e. will be hosting the ultimate fan and artist interactive experiences throughout the festival. f.y.e. is the only place at the festival to get all your favorite band’s music – and maybe even get to meet your favorite Monster Energy Welcome To Rockville performer. Check back for updates on artist meet and greet and autograph signing sessions. Jack Daniel’s: Jack Daniel’s brings the “Taste of Tennessee” to Jacksonville as an official sponsor of Monster Energy Welcome To Rockville with the first ever “Whiskey Row” that features all the great Jack Daniel’s offerings. In addition, The Jack Daniel’s Experience, a mobile museum, is bringing a little of the much-loved distillery from Lynchburg. The Experience is open to all folks, 21 years old and up, for tours free of charge throughout the festival. The Whiskey Row will feature a full line of Jack Daniel’s products as well as Woodford Reserve and Old Forester bourbons. Zippo: Zippo Encore will be back in action at Monster Energy Welcome To Rockville with a full stock of Zippo lighters, including limited edition Monster Energy Welcome To Rockville festival designs. Come by and check out their contests and giveaways or get a free lighter fill or tune-up. Be sure to bring your Zippo lighter to the festival, it could be your ticket to special “Can’t Buy” experiences. Jägermeister: Jägermeister has been rockin’ with Monster Energy Welcome To Rockville fans since day one and we are excited for an even bigger and better 2016 festival, with the launch of the Jäger Live Lounge. This will be a must see festival destination for fans 21+ and will feature a live DJ, lip synch battles throughout the weekend, and plenty of cold beverages. Monster Energy Welcome To Rockville Ferris Wheel: The ferris wheel returns for its second consecutive year. Make sure to find it on the map, take a ride, and see the beautiful St. Johns River for that ultimate Rockville photo moment. Gourmet Man Food: Gourmet Man Food (“GMF”) has been part of American culture since pioneers started experimenting with their cowboy menus to “kick things up a notch.” Since then, it’s become a phenomenon of artistically created, statement-making food, served in large portions with a powerful presentation. It is a unique twist to foods you know mixed with flavors you don’t expect. The current 2016 Monster Energy Welcome To Rockville Gourmet Man Food lineup includes: Angry Bird Grill, Aporkalypse Now, Black Rock Grille, Brucci’s Pizza, Captain Nemo’s, Catullo Brothers Pizza, Cheese Louise, Chicago Taste Authority, Classic Home Cookin’, Cravin’ Cajun, Girls Gone Green Nacho Bar, Grumpy’s Homemade Ice Cream, Hebros Bacon Restaurant, Island Girl Foods, Island Noodles, Jim’s Roasted Corn, Knuckle Sandwiches, Mac’ Attack, Mama’s Food, Master Of Patties, Mount Olympus, and Up In Smoke BBQ. The Gourmet Man Food selections in the VIP Lounge will include: What’s The Catch, Pounders, Rock N’ Roll Arepas, Mystery Melt Machine, and Pie Baby. The Music Experience: The Music Experience (TME) is a free, interactive “rock star” exhibit where fans can get hands-on interaction with tons of musical equipment—much of which is used by their favorite artists performing on stage at the show—and attend meet and greets with various Monster Energy Welcome To Rockville artists. The Music Experience will also feature The Student Experience (TSE) for kids enrolled in music programs in the surrounding areas. TSE features a backstage tour for kids to see the inner workings of a festival and all the jobs the music industry has to offer. TME also offers intimate time with all the instrument manufacturers before the festival opens. 2016 participating manufacturers include: ESP, EMG, PRS, Fender, Earthquaker Devices, Epiphone, Kramer, Korg, Blackstar, Ashdown, Spector, Yamaha Marshall Headphones and Bluetooth Speakers, Takamine, Dunlop, MXR, Way Huge, Yamaha and Vox. For more information, visit www.TheMusicExperience.com and www.TheStudentEXP.com. Jacksonville Jaguars: Monster Energy Welcome To Rockville will include onsite activities facilitated by the Jacksonville Jaguars, who will also partner to host the Ultimate Rock-N-Jock Experience contest. One lucky winner will receive prizes from the Jaguars and Monster Energy Welcome To Rockville. The Monster Energy Welcome To Rockville Craft Beer selections will feature top breweries from the region, including Jacksonville’s Bold City Brewery (Duke’s Brown Ale, Orange Screamsicle), Jacksonville Beach’s Green Room Brewing (Head High IPA, Count Rock-U-La), St. Augustine’s Ancient City Brewing (AC/BC – Back In Black Cherry Ale, Matanzas River Red Ale) and many more to be announced. Take Me Home Animal Rescue: Take Me Home is a not for profit, volunteer based foundation that has been saving the lives of homeless animals since 2001. Many families living in low-income areas cannot afford medical care, basic vaccinations, or spay/neuter surgeries for their companion animals. The donations raised help us to fund mobile veterinary hospitals to travel into these under-served areas to provide free spay and neuter, vaccinations, microchipping and administer medical care for animals in desperate need. Take Me Home also supports local animal charities and is making a donation to Friends of Jacksonville Animals with Jacksonville’s Animal Care and Protective Services. Come by the booth to help out our furry friends by buying a shirt and entering the 50/50 raffle. Danny Wimmer, Founder, DWP, said, “DWP is proud to support various charities, giving them a national platform to promote their messages. We are particularly fond of Take Me Home, which advocates for animal adoption. I hope everyone stops by their booth and supports their fundraising efforts to help animals in need by participating in the 50/50 lottery.” For more information, please visit: www.takemhome.tv. Dyin 2 Live/Fxck Cancer: The F C Cancer Foundation’s mission is to fight cancer by raising awareness and to educate about early cancer detection, ultimately putting an end to late stage cancer diagnosis. Through our Dyin 2 Live wish granting program, we look to enrich the lives of those fighting cancer by offering them an experience that will bring joy, hope, inspiration, and courage into their lives. In doing this, the program hopes it can help give the cancer fighter a chance to forget, even if it’s only for a day, what they are battling. We hope it can be used as a source of inspiration to those needing a brighter day in their darkest hour. For more information, please visit: www.FxckCancer.org, www.makingdreamshappen.org and www.Dyin2Live.org. Monster Energy Welcome To Rockville Tequila World Presented by El Jimador: The Monster Energy Welcome To Rockville Tequila World Presented by El Jimador returns for its second year and will feature a variety of tequila flavors and options from the El Jimador brand. Admission to this area is free and open to those 21 and up. Florida’s biggest rock festival kicks off the World’s Loudest Month festival series and is produced by Danny Wimmer Presents, a producer of some of the biggest rock festivals in America, including Rock On The Range, Monster Energy AFTERSHOCK, Monster Energy Fort Rock, Monster Energy Carolina Rebellion, LOUDER THAN LIFE, Northern Invasion, The Big Ticket, Monster Energy Rock Allegiance, and more. After expanding into the adjacent EverBank Field grounds in 2015, Monster Energy Welcome To Rockville drew a record crowd of 50,000 and continues to grow. The festival is fueled by Monster Energy. Additional 2016 sponsors include: Bud Light, f.y.e., Jack Daniel’s, Zippo Encore, Matador Beef Jerky, Jägermeister, El Jimador Tequila, The Music Experience, Marshall Headphones, Take Me Home Animal Rescue, Fxck Cancer’s Dyin2Live, Jacksonville Jaguars, Jacksonville Sharks, Metro PCS and more.